When will Bajo sospecha spain premiere date. New release date on DateReliz.com: trailers, spoilers, cast. 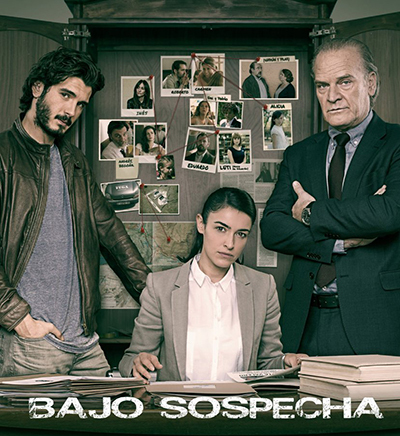 Bajo sospecha (in English – Under suspicion) is a crime drama serial of the Spanish media group Atresmedia. Bajo sospecha Release Date was on February 17, 2015. It was broadcasted on the Spanish channel Antena 3. The creators are Yon Gonz?lez and Llu?s Homar. The drama has a detective plot-line concerning a missing child and an investigation of two detectives revealing secrets of the family. The serial predominantly got a great feedback thus the producers decided for continuation. The leading characters are Victor Reyes, one of the agents, Laura Cortés, the second agent and Inspector Casas. Yon González is performing the first agent. He a talented Spanish actor acting in The Boarding School, Spanish television series. Blanca Romero has a lead of the woman-agent. She is a Spanish actress as well as a model and a singer. Lluís Homar as the Inspector is a well-known Spanish actor and theatre director. The first season revolves around a missing child, 7-year old girl Alicia Vega from the wealthy family. She disappeared while her First Communion from the church. The police decided that the kidnapper is among guests in the church or inside the family. They send two agents Victor and Laura to pretend a married couple and become familiar with the family of the missing girl. While the investigation Victor and Laura is getting know each other as they have never worked together before. They have two totally different personalities: she is strict, accurate and principled while he is over-self-confident, impulsive and impudent. The truth about the loss changes the life of the Vega family as well as Victor and Laura. In the second season Victor again is under cover, this time in the hospital where one young French girl is disappeared and a nurse is dead. A French inspector has to join the investigation. Here come two opposing visions on the case and to different ways to investigate. The serial first was planned to contain 10 episodes. After editing process it was made up of eight as twenty percent was cut. In May 2015 the producers decided to prolog the serial for the second season. Bajo sospecha Release Date of the second season is March 17, 2016.